The Trailside Heights Housing Development plays a critical role in the lives of hundreds of Anchorage residents. 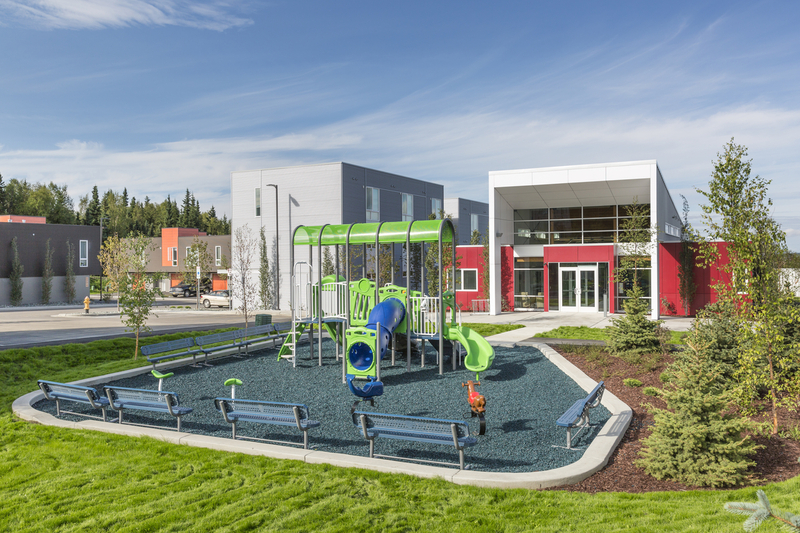 This new community in South Anchorage includes 121 two and three bedroom residential units, a park, and community building. The site design provides for pedestrian connectivity to a public school, church, and mass transit as well as other amenities. Within days of open enrollment, Volunteers of America Alaska received over 1,200 applications, showing the real need for affordable housing in Anchorage. As you can imagine, there is tremendous pressure to meet very restrictive budgets in any affordable housing project. EEI’s engineering innovations made the project viable. These innovations included a roadway variance that saved the client more than $500,000, Low Impact Design (LID) rain gardens, and incorporating undesirable fill into non-structural areas of the development. This project won the Engineering Excellence Grand Award in 2015. The award is presented each year at the Anchorage Engineers Week Banquet.